← Butterflies for St. Valentine’s Day, 2013. 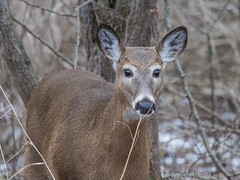 During the past few weeks, while waiting for spring’s delayed arrival, I’ve continued to visit local nature areas as well as my own backyard feeders and wooded trails. 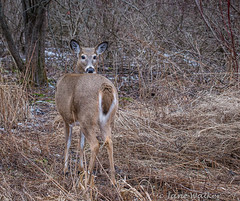 Lynde Shores and Hall’s Rd., located in Whitby, Ontario are less than a mile apart with a large marshy area in between. This area is known for its large selection of water fowl as well as song birds. Many of the birds are very accustomed to people and many will take seeds right from your hand. It’s a wonderful place to take children and for photographers to get some great close-up shots. Two weeks ago, I set out for Hall’s Rd. to try my luck at photographing the “resident” barred owl. It was a cloudy, blustery day by Lake Ontario. I was fortunate to see the owl on a low branch with very few twigs obstructing my view. Occasionally, he would open his eyes but most of the time, he appeared to be sleeping. An hour later at Lynde Shores, it began to snow and along with the birds found myself in a sea of twirling snowflakes. A moment later, I was rewarded with the sighting of a Great Blue Heron. Above is a collection of photos taken on my recent visits to these 2 areas. 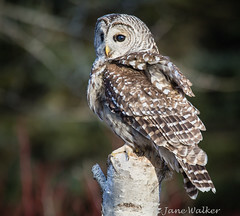 This entry was posted in Uncategorized and tagged barred owl, Cardinals, chickadees, Great Blue Heron, Hall's Rd.' Whitby, Lake Ontario, late spring, Leisistic Chickadee, Lynde Shores, nature, owls, Red Winged Blackbirds, song birds, Water Fowl, Woodpeckers. Bookmark the permalink. Simply beautiful pictures Jane. Sure is a great sign of Spring around the corner. Glad you enjoyed them. “Think Spring!”. Hopefully I will soon have some flower photos! Once again some wonderful photos Jane ! I really love the photo of the seagulls under the snow. The shots of the Great Blue Heron and Canada Geese are amazing, it’s great to see them in flight. Wow, you could capture a Barred Owl ! They are not easy to observe ! I’ve been observing birds for the past 20 years and the Owls are the species which I have seen the least. I think I only saw 3 of them. 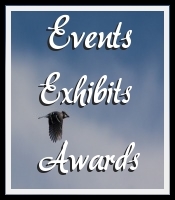 The photos are all so beautiful, I also love the female Mallard, the Mourning Dove, Oh ! I love them all ! What lens do you use when you photograph birds ? It’s so nice to hear your positive comments, Jocelyn. I just haven’t been blogging much lately. I’ve been out with my 100-400 mm Canon L series lens trying to get pictures of 2 owlets in a nature area not far from Lynde Shores. Like you, I’ve seen very few owls in my lifetime and it’s so exciting to see them in the wild. The Great Horned Owls and their owlets are so high up in 100′ white pines that I can’t usually find them myself. I look for the birders and the photographers and then look up….way up! These are great, Jane! I really like the sleeping Barred Owl. It was nice to see the female Cardinals, too. I never see Cardinals up here. We have tons of birds this spring though. Yesterday there was a nesting pair of Golden Eye Ducks in our little bay. They’re so beautiful! You should come and take some shots! Lovely series, Jane. The perspective and framing highlight each birds natural character. Something often overlooked by other photographers. Thank you Daniel for your comments. It is true that as I’m becoming more familiar with birds, I try to capture a bit of personality in my shots. Photography opened up a whole new world for me…that of birding!